What have foreskin and a cigarette box in common? Foreskin lat. Praeputium; Skin sheet which covers the glans of uncircumcised men. 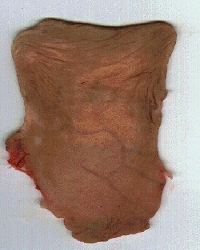 The surface of the outside and internal foreskin sheet corresponds the size to a cigarette box. Parents that want to circumcise their sons for prophylactic reasons are allowed since the circumcision law to do so. The benefits of infant circumcision include prevention of urinary tract infections (a cause of renal scarring), reduction in risk of inflammatory foreskin conditions such as balanitis, foreskin injuries, phimosis and paraphimosis. When the boy later becomes sexually active he has substantial protection against risk of HIV and other viral sexually transmitted infections such as genital herpes and oncogenic human papillomavirus, as well as penile cancer. The risk of cervical cancer in his female partner(s) is also reduced.